Sarah Palin may be out at Fox News, but that doesn’t mean that her face will stop popping up on your various screens. In a brief interview with Breitbart’s Stephen Bannon (who wrote and directed the Palin hagiography The Undefeated), Palin suggested that she plans to try to take an active role in the GOP’s 2014 mid-term offensive. “It’s going to be like 2010. But this time around we need to shake up the GOP machine that tries to orchestrate away too much of the will of constitutional conservatives who don’t give a hoot how they do it in DC.” And while a Palin source told New York’s Gabriel Sherman Mama Grizzly doesn’t mind being “off the stage,” she didn’t come off as someone looking to give up the spotlight. 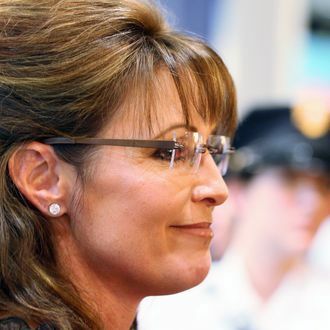 “I know the country needs more truth-telling in the media,” Palin said. “And I’m willing to do that.” As always.